I'm a 3D artist working mostly in Arch Viz for 9 years. Started with 3dsmax, but because of its bugs switched to Blender and now do my job with Blender, since 2007. About "Bedroom for Furniture Catalogue:"
This was a very quick project for a furniture manufacturer in Moscow. 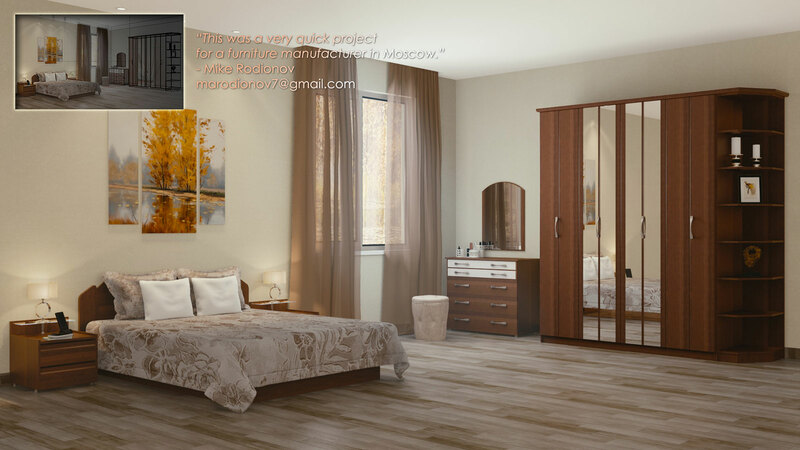 They sent me a photo of this bedroom furniture, and they asked me to make an image for their catalogue. All was done for one evening and Blender Internal rendered it for 41 minute.